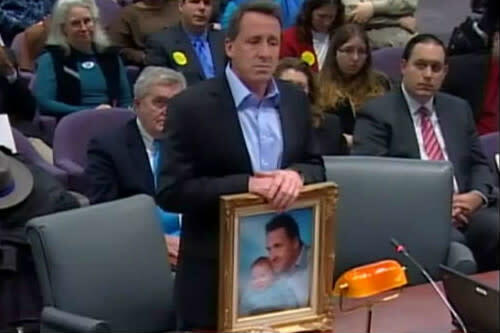 Was father of Newtown victim ‘heckled’ by pro-gun advocates? MSNBC has told the Washington Post that it's reviewing its editing of a video that appeared to show gun rights advocates heckling the father of a Sandy Hook Elementary School shooting victim during a state legislative hearing on gun violence. At Monday's hearing in Hartford, Conn., Neil Heslin, father of 6-year-old Jesse Lewis, challenged lawmakers and lobbyists to prove why assault-style rifles—like the one reportedly used in last month's massacre in Newtown, Conn.—should be legal. I don’t know how many people have young children or children. But just try putting yourself in the place that I’m in or these other parents that are here. Having a child that you lost. It’s not a good feeling; not a good feeling to look at your child laying in a casket or looking at your child with a bullet wound to the forehead. I ask if there’s anybody in this room that can give me one reason or challenge this question: Why anybody in this room needs to have an, one of these assault-style weapons or military weapons or high-capacity clips. ... Not one person can answer that question. "The Second Amendment!" several people shouted in response. "We're all entitled to our own opinion, and I respect their opinions and their thoughts," Heslin said. "I wish they'd respect mine and give it a little bit of thought, and realize it could have been their child that could have been in that school that day." But MSNBC's clip of the exchange on Tuesday omitted Heslin's open challenge to the audience. The cable network segment included a graphic that read, “Mocked and Loaded: Sandy Hook Victim’s Father Heckled by Gun Rights Advocates," to hammer home the point. Twitchy, the website founded by conservative pundit Michelle Malkin, was among several to criticize MSNBC and other members of the "left-wing" media, like Piers Morgan, for selective reporting on the incident. "What kind of sick, twisted mind HECKLES a man whose son was just murdered, as he begs for gun control?" Morgan wrote on Twitter. "Just unbelievable." "It's pretty hard for me to imagine anything that would make me shout across the room at a father who'd lost his son, no matter how much I disagreed with his reaction to that loss," the Daily Beast's David Frum, who was among those criticized for using the "heckling" label, wrote. "There are lots of ways to express disagreement, and in such a case the best ways all begin with an expression of sympathy and condolence."